After dropping some details on their 2019 TV offering a few days ago and showing off their first 8K TV at IFA, LG officially unveiled its first commercial-grade 8K OLED TV: the Z9 OLED. 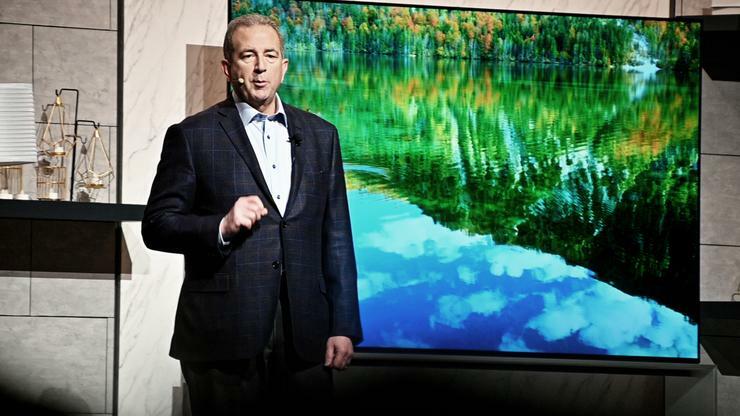 Showing off the 77-inch premium home entertainment product during their CES press conference, LG talked up the AI-upscaling made possible by the TVs new next-generation Alpha 9 processor. Like Samsung's own 8K solutions, it'll automatically upscale non-8K content using AI algorithms. LG say that "in addition to content source detection, the new processor finely adjusts the tone mapping curve in accordance with ambient conditions to offer optimized screen brightness, leveraging its ability to understand how the human eye perceives images in different lighting. The processor uses the TV’s ambient light sensor to measure light levels, automatically adjusting brightness to compensate as needed." LG are also using the deep learning capabilities to enhance sound quality. They say the the intelligent algorithms of the 2nd-gen α9 processor can up-mix two-channel audio to deliver convincing virtual 5.1 surround sound. The Z9 will also utilise HDMI 2.1 to support higher and variable frame-rate content and EARC audio. LG are also upping the ante when it comes to on-board smarts. Each of the company's ThinQ TVs will now come with both on-board Google Assistant and built-in Amazon Alexa. Apple AirPlay and HomeKit support are also being added. However, unlike the similar announcement Samsung made yesterday, there's no signs of a specific iTunes Movies & TV app for LG's WebOS. No word yet on local pricing and availability for the Z9 but expect further details to come later in the year.